Buying a projector can be a tricky process, which involves wrapping your head around more than a handful of complicated acronyms and tech terms. Even once you’ve bought the projector itself, the challenge continues as you look at how to connect it up to the various input devices in your home cinema system. This isn’t as simple a process as plugging it in and switching it on. 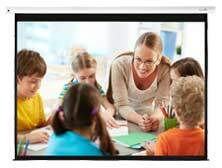 Different projectors and input devices use different technology, with each variation requiring a minimum speed of data transfer, so the advanced features you’ve invested in can be fully realised on the projector screen. This guide is designed to give you a breakdown of the various projector cables and their uses and limitations.. Typical Application - Between BluRay DVD players, SKY HD boxes, SKY Q boxes or 4K UHD Games consoles to display devices. Summary - HDMI is the cable of choice for home cinema installations as it is able to transmit video, audio and data in one single cable up to 4K UHD resolution. With increasingly varying types and levels of both resolution and high dynamic range, a simple, all-purpose HDMI cable is not going to cut it for all of your tech. Think of your projector cable as a corridor. The more complicated and high tech your projector is, the more ‘traffic’ is going to need to travel through it, meaning the corridor, or cable, needs to be wider and sturdier to handle it. So, how can you find the right sized cable for all that high tech traffic and ensure the best possible performance from your home cinema projector? Read on for our guide on which HDMI cables to buy for your usage scenario. Let’s start with the most common home cinema scenario. You’ve bought a Full HD projector and you want to watch HD content on it, or the occasional Blu-Ray disc. If your projector is standard high definition (HD) resolution, in other words 1920 x1080 pixels, and you’re watching standard HD or Blu-Ray content, then most standard HDMI cables will be compatible with your home cinema setup. We recommend the Techconnect, SlimWire and ActiveWire HDMI cables as best for HD tech; which one you choose will depend on the length of the cable you require – yes length is another factor at play here if you want the traffic to flow at maximum efficiency. Both the SlimWire and ActiveWire HDMI cables support data transfer speeds of up to 10.2 gigabytes per second (Gbps), which is more than enough for the demands of HD content, the fastest of which generally requires just 54Mbps. These wires will also support some lower speed 4K content however it’s best to assume that a 4K projector requires higher speed cabling – more on that down the page. Like we said, the length of a cable is another factor in how data flows from an input device to your projector. So here are our suggestions for the best HDMI cables for watching HD content on your Full HD resolution projector, with different suggestions depending on your individual setup and the length of cable required. If you’re stepping it up a level and want to watch 4K content on your 4K projector, it’s even more important to buy the right cables to realise the best picture from your investment. Achieving the right level of data transfer speed with 4K content is not quite as simple a process as with standard HD. As well as the resolution of the images being projected, you also have to contend with the challenges of HDR (High Dynamic Range) content. The most basic 4K projectors will operate with a minimum cable size of 10.2Gbps cable. In order for these cables to work, the projector must have less than 10bit colour, and must not be HDR enabled. Most 4K projectors, however, will use some combination of these technologies, so you’ll likely need a more heavy duty cable. For 4K projectors with 10-bit colour, but no HDR capability, a minimum data transfer speed of 11.1Gbps will be required. 4K projectors with higher than 10-bit colour and/or HDR capability will require a minimum data transfer speed cable of 18Gbps. In general, it’s best to assume that the higher speed cable is required, since this will work as well on lower speed technology and gives you the option to upgrade. Add to that the fact that HDR content is only going to get bigger and bigger over the coming years, and it’s well worth preparing in advance for the upgrade. With that in mind, here are our suggestions for cabling for watching 4K content on a 4K projector, again, bearing in mind the importance of length of cable for your installation. Finally, what about 4K gaming? We’re at the top of the game here but 4K is making waves through the gaming industry just as it is in the film world. Although the list of 4K and HDR enabled games is still fairly limited – it’s only going to grow, so if you’ve invested in the projector, then make sure you invest in the right cabling too. A growing number of consoles now deliver HDR-enabled 4K content, which will require an 18Gbps cable if you want to see that 4K realised on your projector screen. As with 4K video content, we recommend the Pixelgen and Nuetec cables outlined below as the best option for 4K gaming. What gaming technology is 4K enabled? HDR 10 - HDR 10, or standard HDR, uses ‘static metadata’ to establish the boundaries of the colour palette at the start of the film. Features 10-bit colour depth. HLG - Hybrid Log Gamma (HLG) combines SDR and HDR signals to ensure that a single signal is compatible with both standard and high dynamic range screens. 10-bit colour depth. Dolby Vision - Uses dynamic metadata to display a wider colour palette, and features 12 bit colour depth. We hope this guide has offered you a straightforward solution to buying the right HDMI cable for your home cinema requirements. The next step is the exciting one: plug it all in and start enjoying your incredible images! Remember that if you’re using multiple sources, multiple cables or splitters at any point in the cable chain – each constituent ‘link’ in the chain must be enabled to the minimum data transfer speed required for your technology. If one part of your network can’t cope with the traffic, the whole thing will be restricted to whatever this narrowest point in the corridor can handle. For more help and advice give us a call on our Freephone number or drop us an email. Typical Application - Between PC's or Mac's to display devices. Summary -DisplayPort cables were first produced in 2006, and were primarily designed to connect video sources to display devices. The technology has the advantages of older VGA or DVI cables, but allows a larger data transfer speed, and a smaller connector so it can fit easily into smaller input devices such as laptops and notebooks. Like HDMI, DisplayPort cables transmit video, audio and data in one single cable and can support 4K content if required. The latest version, DisplayPort 1.4 supports data transfer speeds of up to 34Gbps, which leaves it capable of delivering 8K resolution images of up to 7680 x 4320px. DisplayPort cables also include an auxiliary channel, which allows the cable to process additional types of information, independent of video and audio data. In practical applications, this commonly includes webcam and USB information. Typical Application - connecting devices to a home or corporate network. Summary - Ethernet cable remains the reliable and popular choice for connecting devices together within a Local Area Network (LAN). In general, this involves linking PCs, Macs, Smart TVs and NAS Drives and yes, projectors, to routers and switches. In some situations, Ethernet can also be used to link two devices, like PCs, to one another. Ethernet cables normally support industry standard data transfer speeds of up to Category 6 (CAT6), meaning they’re capable of transmitting video, audio and data up to 4K resolution. Ethernet cables are generally manufactured in two forms: solid and stranded. The former offers better performance but less durability, making them more suited to situations where the cable is unlikely to be moved. Stranded cables sacrifice performance for durability. Summary The DVI, or digital video interface cable, is designed to connect a video source to a display device. It comes in three main types: analogue only, digital only, and both, known as DVI-A, DVI-D and DVI-I, respectively. The interface transmits video signals only. DVI cables are at a disadvantage to HDMI cables in that they are unable to carry the additional audio data that HDMI can. Furthermore, they will struggle to process 4K resolution images and as such are generally only used for HD resolution video or static image or data content. Typical Application - Between PC's and display devices. Video signal transmission only. Summary VGA is capable of supporting up to 1920 x 1200 WUXGA resolution. But as it’s an analogue connection, the signal is subject to interference and potential image ghosting if used on long cable runs. VGA, or Video Graphics Array cables, are an older interface that pre-dates technology such as DVI and HDMI. It is therefore increasingly less common to see VGA used in conjunction with modern devices. The cables feature 15 unique pins, each with a distinct function. The first three, for instance, each transfer one of the three primary colours. Again, while the cables are capable of supporting up to 1920x1200px (WUXGA) resolution, due to the nature of the analogue connection, this is not always as consistent as later digital counterparts. Typical Application - Between DVD player or games console and display devices. Video signal transmission only. Summary - Signal is separated into 3 channels of red, green and blue and transmitted. Capable of supporting up to Full HD images, that’s 1920x1080px resolution. However, it should be noted that this is an analogue connection so the signal is subject to interference and potential image degradation. The Component Video cable features three distinct wires, each of which transmits one of the three primary colours. As the name would suggest, its main purpose is to transmit video information through the three distinct components. As with many analogue cables, Component Video interfaces are being used on fewer and fewer models as the connection is less reliable than newer, digital alternatives. Typical Application - Between VCR or standard DVD player and display devices. Video signal transmission only. Summary - The S-Video is rarely used nowadays – particularly in any modern technology but if you’re using older devices it might still be worth knowing about. Before the advent of high definition resolution, S-video cables were the signalling standard for video content. These cables carry video content only, no audio. The technology operates by separating the chroma (black and white) and luminance (colour) signals and transmitting them via separate pins. For this reason, the image quality is generally superior to earlier composite video models, yet with lower colour resolution than the later component video cables. Typical Application - Between standard DVD player or games console and display devices. Video signal transmission only. Also Known As - Single phono, 1 RCA, Cinch video. Summary -These cables only carry video signals and they are pretty much the lowest quality cable for a video source, as the entire video signal is transmitted over one cable. Composite video connections combine the colour and black and white signals of the video transmission. Generally, the video is transmitted in 480i or 576i standard definition image quality. Composite video cables were largely replaced by later S-Video cables, which were in turn replaced by newer, digital cables. These cables have been virtually eliminated from many modern day technological interfaces.